It’s hard to find me gushing more unapologetically than when I talk about the virtues of my favorite programming language, Python. Indeed, my life for the last 3 years has been dominated by the language. In many ways, pursuing a startup and enduring the associated financial hardship was partially because I had become frustrated with using Java in my full-time work and wanted to convert hobby projects I was building outside of work hours into full-fledged projects. Something else I noticed in the last three years is that my programming life has become very zen-like. I now rarely discuss or debate things like programming language features, strange constructs like generics, or which framework to use or ignore. Instead, I spend most of my time building a product that people love. My colleagues and I communicate with code. And what better language to communicate in than arguably the world’s most readable? What better language to deliver value in than one that simply gets out of your way? I therefore get a great amount of joy of showing other people what the Zen of Python can mean in their lives. Last year, I gave a training course to a 20-person team of government employees who were using dated languages like Fortran and COBOL to build important government systems. A bright manager in the organization realized how much more productive their team could be if they stopped worrying about compiler versions and IDEs and started thinking in code. But the key was to understand the value of Python, not necessarily as a language with a certain set of features, but as a way of doing things, as a cultural influence. This is a culture that says, “the language should fade away”, similarly to how Edward Tufte argues that the chrome and administrative debris should fade away when displaying content. Since then, I have used these slides countless times to espouse the virtues of my favorite interpreter. This has included giving short seminars in NYC, training Parse.ly interns and new hires (here’s a shot of me and two Parse.ly engineers, Michael and Zach), holding Python office hours at HackNY’s hackathon (indeed, here’s an action shot on Flickr to prove it! ), and introducing my friends to the joy of building software. Or, if you’re not interested in the code behind the slides (because the slides are actually created with the help of Python itself), you can go here to simply view them. This may be my first “open source presentation”, in that the slide presentation itself is provided as code that is freely available, and reproducing the slide presentation is a matter of running a code generator. I mentioned that one of the reasons I love Python is because it gets out of your way. Nowhere is this more evident than Python’s ability to prototype algorithms to natural language processing and corpus linguistics problems, something I do everyday. 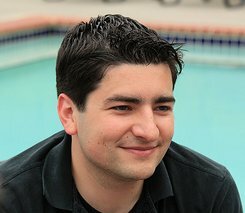 The Natural Language Toolkit (NLTK) provides an excellent starting point from learning about this aspect of computer science. Between these two pieces, you can learn the Zen of Python (PEP 20) very rapidly, and incorporate it into your everyday software life. If you have any comments or feedback, feel free to reach out to me on Twitter. I’d love to hear what you think. And if you, too, are bitten by the Python bug (as one of our Parse.ly interns recently was in a big, almost romantic way) then you should reach out to us, since we’re hiring. Thank you Andrew for such a nice write..! Apart from the above notes, do you recommend a good Python book? 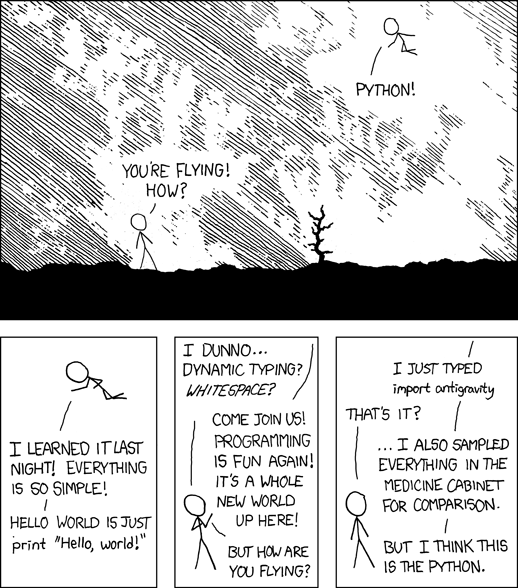 I recommend Learn Python the Hard Way or Dive into Python. Sorry for the intrusion, but they are really good books. I promise.